Some days just get better and better. With our “Triple A” category, you can’t really do anything wrong—no matter what your mom says! These skis are designed to make you look good, feel good and generally become a better person. The Adventure All-Mountain category is sporty, it’s fun and it’s often the majority of who’s in the liftline. It’s no accident snow, skiing and smiles all start with the same letter. Good runs should end with your monkey lips stretched ear-to-ear as you enjoy beautiful terrain and rip exciting lines in a variety of snow conditions. These easy-to-turn, medium-wide and stable adventure sticks make life fun. FIND SKIS using Ski Canada’s interactive ski test tool – SkiFinder. Also available as a free app from the iStore & Google Play. MEN & WOMEN: The Vantage 90 CTi offers all-mountain performance with a killer attitude. It will put a grin on your face as you swoop long turns on a freshly groomed carpet of corduroy. As Chris Candow commented, “Intermediate skiers will like this one if snow conditions are consistently soft. 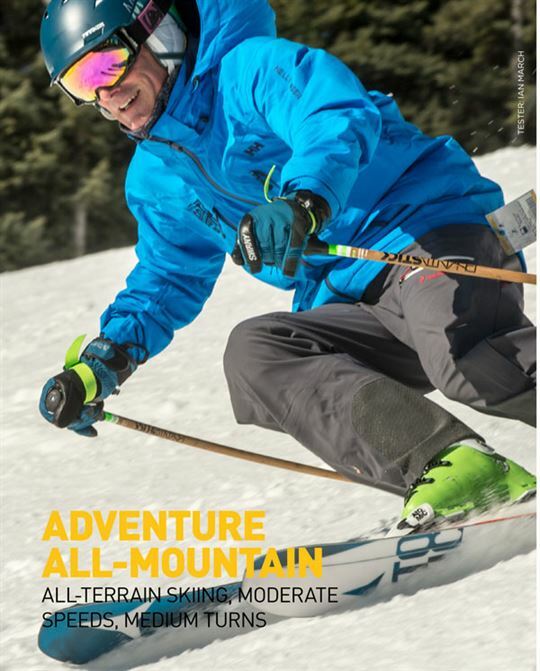 Going fast on hard snow gives some chatter.” Yet the ski is exceptionally versatile, allowing riders to excel at everything and explore the mountain at moderate speeds. 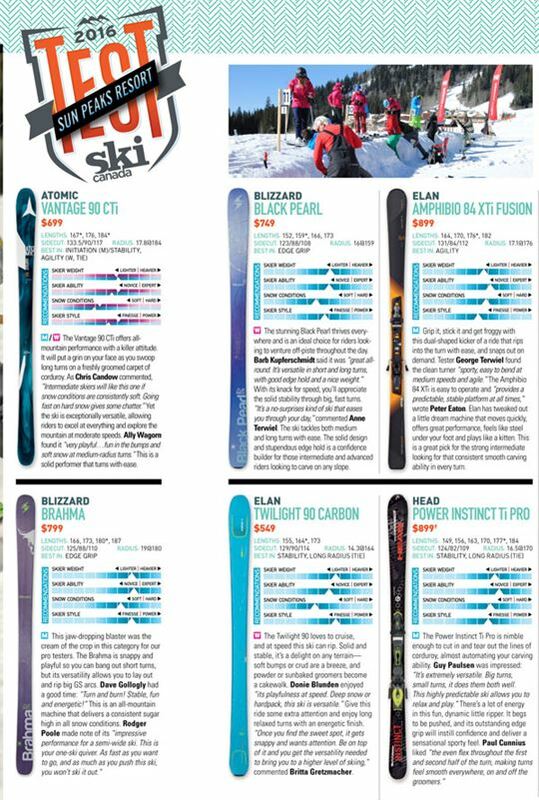 Ally Wagorn found it “very playful…fun in the bumps and soft snow at medium-radius turns.” This is a solid performer that turns with ease. WOMEN: The stunning Black Pearl thrives everywhere and is an ideal choice for riders looking to venture off-piste throughout the day. Barb Kupferschmidt said it was “great all-round. It’s versatile in short and long turns, with good edge hold and a nice weight.” With its knack for speed, you’ll appreciate the solid stability through big, fast turns. “It’s a no-surprises kind of ski that eases you through your day,” commented Anne Terwiel. The ski tackles both medium and long turns with ease. The solid design and stupendous edge hold is a confidence builder for those intermediate and advanced riders looking to carve on any slope. MEN: Grip it, stick it and get froggy with this dual-shaped kicker of a ride that rips into the turn with ease, and snaps out on demand. Tester George Terwiel found the clean turner “sporty, easy to bend at medium speeds and agile.” The Amphibio 84 XTi is easy to operate and “provides a predictable, stable platform at all times,” wrote Peter Eaton. Elan has tweaked out a little dream machine that moves quickly, offers great performance, feels like steel under your foot and plays like a kitten. This is a great pick for the strong intermediate looking for that consistent smooth carving ability in every turn. WOMEN: The Twilight 90 loves to cruise, and at speed this ski can rip. Solid and stable, it’s a delight on any terrain—soft bumps or crud are a breeze, and powder or sunbaked groomers become a cakewalk. Donie Blunden enjoyed “its playfulness at speed. Deep snow or hardpack, this ski is versatile.” Give this ride some extra attention and enjoy long relaxed turns with an energetic finish. “Once you find the sweet spot, it gets snappy and wants attention. Be on top of it and you get the versatility needed to bring you to a higher level of skiing,” commented Britta Gretzmacher. MEN: In soft snow and steep runs, athletic riders who love excitement will rip swoopy turns with ease, hop rocks and wiggle into tight spots in their pursuit of unfathomable powder. “It’s awesome in the trees; a deep-snow ripper,” commented Ski Canada tester Erin Keam. The Pinnacle 95 slams a home run in all conditions, holding a particular shine for days filled with fluffy fresh snow. Kristian Armstrong noted that it “likes to live on the edge. There’s great turn shape and feel to this ski.” The soft rockered tip smooths out bumpy terrain with luxurious comfort, making this all-mountain explorer a standout in this category. 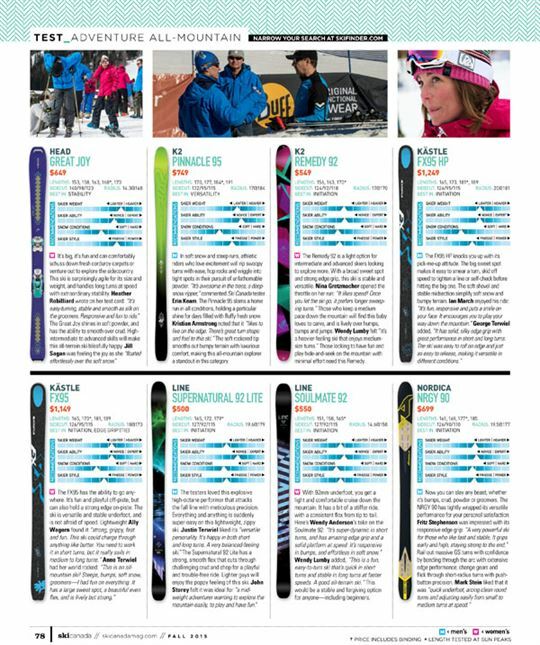 WOMEN: The Remedy 92 is a light option for intermediate and advanced skiers looking to explore more. With a broad sweet spot and strong edge grip, this ski is stable and versatile. Nina Gretzmacher opened the throttle on her run: “It likes speed! Once you let the ski go, it prefers longer sweeping turns.” Those who keep a medium pace down the mountain will find this baby loves to carve, and is lively over humps, bumps and jumps. Wendy Lumby felt “it’s a heavier-feeling ski that enjoys medium-size turns.” Those looking to have fun and play hide-and-seek on the mountain with minimal effort need this Remedy. WOMEN: With 92mm underfoot, you get a light and comfortable cruise down the mountain. It has a bit of a stiffer ride, with a consistent flex from tip to tail. Here’s Wendy Anderson’s take on the Soulmate 92: “It’s super-dynamic in short turns, and has amazing edge grip and a solid platform at speed. 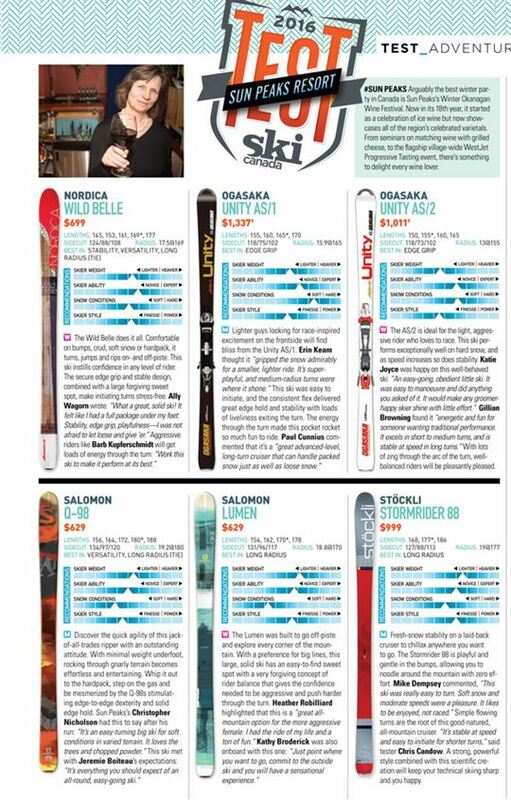 It’s responsive in bumps, and effortless in soft snow.” Wendy Lumby added, “This is a fun, easy-to-turn ski that’s quick in short turns and stable in long turns at faster speeds. A good all-terrain ski.” This would be a stable and forgiving option for anyone—including beginners. WOMEN: The AS/2 is ideal for the light, aggressive rider who loves to race. This ski performs exceptionally well on hard snow, and as speed increases so does stability. Katie Joyce was happy on this well-behaved ski: “An easy-going, obedient little ski. It was easy to manoeuvre and did anything you asked of it. It would make any groomer- happy skier shine with little effort.” Gillian Browning found it “energetic and fun for someone wanting traditional performance. It excels in short to medium turns, and is stable at speed in long turns.” With lots of zing through the arc of the turn, well-balanced riders will be pleasantly pleased. MEN: Fresh-snow stability on a laid-back cruiser to chillax anywhere you want to go. The Stormrider 88 is playful and gentle in the bumps, allowing you to noodle around the mountain with zero effort. Mike Dempsey commented, “This ski was really easy to turn. Soft snow and moderate speeds were a pleasure. It likes to be enjoyed, not raced.” Simple flowing turns are the root of this good-natured, all-mountain cruiser. “It’s stable at speed and easy to initiate for shorter turns,” said tester Chris Candow. A strong, powerful style combined with this scientific creation will keep your technical skiing sharp and you happy. WOMEN: The Stormrider Motion is for riders who love to push boundaries. This ski allows you to enjoy the versatility and comfort to confidently roam in unchartered territory, yet on the groomers you still have a dynamic performer. According to tester Sandra Haziza, “It’s smooth and sensual, a beautiful ride. Fast, furious and fun at high speed. Lovely and responsive in the bumps.” Valerie Cahill made note of the ski’s ability “to push through the clumpy snow,” so no matter what bumpy or rough terrain your day delivers, this is one ride that boasts stability and reliability for handling anything thrown your way. MEN: Performance is not an issue if you have the drive to grit your teeth, push your comfort zone and just let go. “Hard chargers will love it. Power, grip, stability—it’s all there,” wrote fan Ian March after his test run. It’s surprisingly versatile to bang off short turns and play in the bumps, yet you’ll still find happiness as you carve big arcs. Fritz Stephenson noted that “it’s perfect for everyday use and the strong guy who likes to go fast. This ski doesn’t disappoint anywhere.” The Kendo is stable throughout the turn, with rock-solid torsional stability delivering consistent precision as it bends through the curve.